Want to know what stand-up comedy can teach you about writing? There are about as many types of comedy as there are genres of literature. Prop comedy. Political comedy. Observations. One-liners. Satire. Parody. Slapstick. Dramedy. You name it, and people have found a way to make it funny. Sometimes it’s wacky, sometimes it’s profound, but no matte, it’s designed to produce a laugh. So, it’s probably no wonder that many styles of comedy have produced great advice for improving your writing regardless of what you write. After all, those jokes had to be written, too. Buy the premise, buy the bit. This Johnny Carson gem applies to world building.For comedy, it means that if you follow a joke that begins, “A duck walks into a bar…” all the way to its punchline, you’ve bought into the premise — a duck can walk into a bar. No matter what you write, but particularly if you write sci-fi or fantasy, if a reader buys into the world you’ve created (think Harry Potter, Fahrenheit 451, the Marvel Universe, etc. ), they’ll follow the story until the last page. Be consistent and don’t violate the rules of your world (that is, if people can come back from the dead in your world, then let them; if they can’t, don’t violate that rule) and people will buy your premise until they’ve bought the bit. If they like you, you can do no wrong. This truism means that if an audience likes a comedian, they will let him get away with a controversial or offensive joke, or stick with him even if a joke or two bombs. If they like you, an audience stays with you. They’re on your side. In literature, this applies to the “unreliable narrator” (think Lemony Snicket). The unreliable narrator can lie, stretch the truth, twist events, etc., but he’s so darn likable (and often funny) that readers go along with it. They accept that unreliability as part of the narrator’s character. They like him, so he can do no wrong. Make your unreliable narrator likable. All comedy is based on incongruity. Hard to argue with the logic of John Allen Paulos here. Punchlines are based on the unexpected. That’s why so many jokes follow “the rule of three.” The first two characters or situations establish a pattern; the third one breaks it. In storytelling, this is your plot point. It’s the event that changes the narrative. Good writing hinges on giving us the unexpected. Break the pattern after scenes and characters have been established. Give us something new and your reader will stay engaged. Open strong and close strong. Another comedy truism is that your opening bit and your closing bit should be the strongest. The middle can be a bit weaker, though it still has to move the act forward and build to that big sendoff at the end. The same is true of writing. Studies show that readers are most likely to remember the beginnings and endings of books. This isn’t to say your book shouldn’t be strong all the way through because, let’s face it, you’re most likely to lose a reader in the middle, but your middle chapters should be filled with rising and falling action — just as a comedian’s act has punchlines and pauses for the audience to catch its breath. Open strong, close strong, and create a middle that keeps the story moving the reader toward that big, climactic finish! Jokes often tell a story. They take you on a short trip to another, often strange but still recognizable world where the listener expects a big payoff. Books are no different. They are often a few hours or a few days journey to another world, and no matter how different from our own, it still contains recognizable elements or features. As with jokes, readers must be able to relate at some level with your characters, setting, and story. The audience must be able to relate to your jokes or your story in some way. If they don’t “get it”, they won’t enjoy it. And readers, like audiences, expect to be satisfied. They want a big payoff. Your final chapter, even if immensely serious, is akin to the comedian’s punchline. And therein lies the rub. Literature can be as subjective as humor. The reason there are so many forms of comedy and genres of literature is that people like different things — or, in the words of comedian Tommy Moore (pictured in this post, and the author of A Ph.D. in Happiness from the Great Comedians and the upcoming Joketelling 101: How I Never Let School Interfere with my (Comedy) Education), “The audience is the variable.” Not everyone will like what you write. At some point, you may even find yourself removed from the story as readers debate or disagree on what your story meant. But like a comedian knowing that a joke will kill one night, do okay the next night, then kill again, then struggle to get a laugh, your story may get good reviews and bad reviews. Just remember the audience is the variable. That comedy trope will keep you sane as you craft your story using some of the great comedy rules above. Remember, you don’t have to write comedy to learn from the great comedians. You just have to use the same approach! 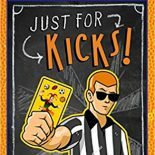 This entry was posted on December 19, 2016 by johnbriggsbooks in Fiction, Publishing, Writing and tagged book reviews, Fiction, humor, writing advice.